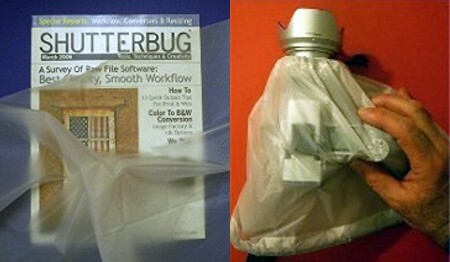 FotoSharp's camera rain covers are made from silnylon that weighs ~1.3 oz per square yard. White silnylon is semi-transparent (see photos below), which allows you to read the print on the camera's controls when the fabric is held against the camera. You can also shoot a TTL flash thru our white silnylon covers. Silicone, which is primarily responsible for making the fabric waterproof and windproof, will last for many years. The application process thoroughly soaks the fibers of the individual threads themselves, thus ensuring that the silicone completely impregnates the fabric. Regular outdoor use, such as stuffing or storing in a carry sack, or deploying for rain/wind protection, do not cause deterioration of the silicone; in fact, the treated fabric remains soft and pliable even at sub-zero temperatures. However, the silicone is slightly water-soluble and repeated long exposure to rain, or repeated washings, can render the fabric less than completely waterproof. Unlike urethane-coated fabrics, that are susceptible to non-repairable deterioration over time, silnylon fabrics can be easily and inexpensively re-treated when needed! Consumer-applied silicone is highly effective in restoring full waterproofing in most fabrics. Silicone liquids and sprays for this purpose are readily available on the market today; they are inexpensive and can be applied easily and quickly. Once-a-year treatments are recommended for fabrics under normal outdoor use. Twice-a-year treatments may be needed for fabrics that receive lots of use. Fabrics exposed to rain only a few times a year, may not need re-treatment for many years. However, note that consumer-applied silicone may be less permanent than factory-applied silicone. Washing with detergent also removes a certain amount of silicone and multiple washings may significantly reduce the ability of the fabric to repel water. Silicone aerosol (w/ 10% silicone) is probably the best option for most silnylon owners since it is readily available and easily applied. While several brands are available, Silicone Water-Guard� is a popular one found at many outdoor retailers, including Wal-Mart. Ever-Dri brand, which comes in aerosol or liquid, can be found at many military surplus and/or shoe stores. ScotchgardTM is perhaps the best-known silicone aerosol. A search engine such as Google will provide many Internet retail sources. Treatment consists of soaking the entire fabric or area of concern making sure to wet both sides of the fabric by applying silicone to both sides. If treating seams, be sure to completely soak the threads as well as the fabric that surrounds the seam. After the first application has dried to the touch, a second application is recommended to help ensure waterproof-ness. FotoSharp's Silnylon Camera Rain Covers are available in sizes 8" to 30"